In a nuanced adaptation of Lionel Shriver’s high-school massacre novel, Lynne Ramsay looks beyond the tabloid headlines to craft a typically lyrical meditation on motherhood and the performance of family life. As in the book, easy explanations for such a tragic event are elided in favour of posing difficult, more fundamental questions. Ramsay’s illustration of the shockwaves from this single, shattering event as they spread from a single point in time, tainting the past, present and future, also tantalisingly suggests what her doomed adaptation of The Lovely Bones could have been, instead of the over-egged CGI schmaltz of Peter Jackson’s big budget affair. Ramsay delivers a characteristically cinematic adaptation here, reworking the collected letters structure of the book into a multi-layered and intricately constructed portrait of one woman’s struggle to account for her son’s behaviour and, crucially, her own responsibility for it. The film pivots on the fraught relationship between Eva (Tilda Swinton) and her son, Kevin (played fantastically by a trio of young actors) whose murderous actions reverberate through their lives and the fabric of the film itself. The supporting cast is also uniformly solid, with John C Reilly ably filling out a necessarily sketchy role as the husband and father unable or unwilling to comprehend either his son’s apparent sociopathy or his wife’s alienation. Tilda Swinton as the tortured and benighted Eva is typically exceptional, managing to convey the full gamut of emotional complexity necessary with an effortlessness which seems to elude far too many Academy Award-winning performers. Performance is an overt theme, with Kevin poking and prodding Eva, seemingly daring her to drop her pretence of performative motherhood. Whatever drives the precocious Kevin, from an early age he clearly senses that she doesn’t love him unreservedly, in the traditional sense – even articulates it to her during a conversation on the impending birth of Kevin’s sister – and rewards and even protects her after she snaps under provocation and physically attacks him. As impressive as Ezra Miller is as the teenage Kevin, it’s Jasper Newell, who plays Kevin between the ages of six and eight, toothless and taunting, perpetually diaper-clad, who lays the groundwork for Miller’s sleek and guileful performance. While Miller is chilling in a way we’re probably all too accustomed to (through countless teenage movie psychopaths), the film is as reliant on Newell’s prepubescent Kevin as it is on Swinton’s multi-faceted performance. The subtle layers of allusion, the repeated visual and aural rhymes and repetitions, seem to reflect Eva’s present day predicament and her own trawling of the past for revelatory details and connections. A scene where Eva discovers a young Kevin vandalising a room she has carefully decorated is accompanied with a repetitive, non-diegetic swishing sound that matches the arcs of paint Kevin has sprayed on the walls. Much later, the sound is revealed to be that of the garden sprinklers that rain down on the murdered bodies of Eva’s husband and daughter. Ramsay’s film is similarly laced with visual threads – Kevin slathering bread with jam, Eva later eating a similar sandwich for Christmas dinner – that all loop back and forth through Kevin’s horrific act, trapping Eva in her self-excoriation. Ramsay’s depiction of this psychological state is poetic without being mannered, lucid but not bludgeoning and a swift reminder of what a singular talent she is. 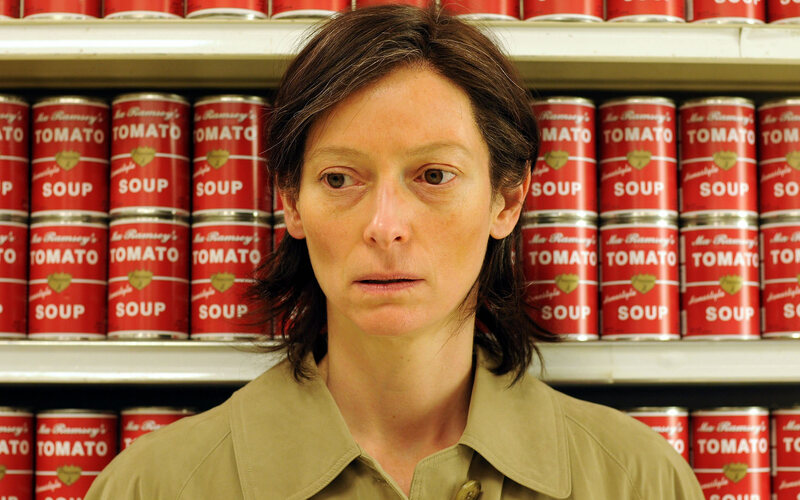 We Need To Talk About Kevin is as engaging and masterfully constructed as Jackson’s Lovely Bones was epically misjudged, all of which makes Ramsay’s nine-year absence from cinemas, languishing in development hell since her last film (Morvern Callar, 2002), all the more maddening. We Need To Talk About Kevin screens at the Glasgow Film Theatre from Tuesday 18th October – Thursday 3rd November. This entry was posted in GFT, Reviews and tagged Film, GFT, Lynne Ramsay, Tilda Swinton, We Need To Talk About Kevin. Bookmark the permalink.